When Bastille Day was moved from its original February release, shortly after the tragic terrorist attacks in Paris late last year, many assumed it was because the French capital would get blown up or destroyed in some way by extremist bad guys, which would have obviously been a bit of a no-no so soon after what happened in real life. But while there is at least one explosion in the film, directed and co-written by Eden Lake’s James Watkins, it is thankfully as far away from the xenophobic and ugly nature of London Has Fallen, another recent international action-thriller, as possible, and is far more entertaining and thrilling because of it – but that’s not to say it’s really a good movie, since sometimes its faults can’t even be masked by the presence of the always-awesome Idris Elba. He plays Sean Brier, a “reckless, insubordinate and irresponsible” (their words, not ours) lone-wolf CIA agent situated in Paris, where he captures young American pickpocket Michael Mason (Richard Madden), a prime suspect in a recent bombing that has killed four people. As we learn, a case of mistaken bag-thievery is what embroils him into unknowingly planting the bomb, and that his innocent participation ultimately leads to the discovery of something much bigger, so Brier and Mason team up to defeat the bad guys and stop anything else from happening. Sure, it’s a standard action set-up, and its reliance on some old clichés makes things a tad more predictable – the reveal of who the main villain is isn’t as surprising as the film thinks it is, as you can tell from their very first scene that they’re a wrong’un just by how they look and even act – but Watkins is keen to at least let the audience have some fun despite the occasional cheesiness of the script. The action scenes have a lot of life in them, from a chase on the rooftops of Paris to a fight in the back of a van, and the integration of social media into the terrorists’ plans that instigates city-wide oppression offers an interesting commentary on the power of today’s media, where anyone who creates a hashtag can hold the power to social revolution right in their hands. Unfortunately, there’s not a lot that the film does with that aspect of the plot, as it’s used mainly to bring the film towards a literally crowded third act, where things escalate to the traditional “movie” climax, where there are shoot-ups a-plenty amidst a high-stakes bank heist so that the audience somehow forgets there was at least a little bit of intelligent thinking prior to all the action. It’s not bad action by any means, but when the film resorts to what it thinks audiences want to see in a film like this when there have been more fascinating elements before it, it’s slightly disappointing that it wasn’t looked into as much as it could have been. There is at the very least the charisma of the lead actors to fall back on, and though Elba and particularly Madden are stuck with obviously-fake American accents and backstories (are we really meant to believe that Madden’s character hails from Las Vegas?) they share fine chemistry with each other and work reasonably well as a duo where each of their skills are used to their full extent. There’s been a lot of talk about Elba being a favourite to replace Daniel Craig as James Bond, and we share that sentiment greatly based on how he handles action scenes and how intimidating a presence he can be in many of those sequences, even though the character he’s playing here is basically DCI John Luther with an American accent. Overall, there’s a fair amount to enjoy about Bastille Day, and even though it definitely has its faults (mostly in the script which falls a little too much into convention) it’s a fun and reasonably entertaining film to just switch your head off and enjoy without feeling too guilty about afterwards. Just imagine you’re watching an episode of Luther as directed by Luc Besson, and you’ll be fine. 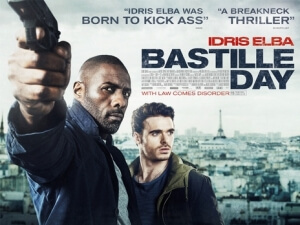 Bastille Day is a fun and entertaining action thriller that gets by on some enjoyable action sequences and the sparky pairing of the ever-charismatic Idris Elba and Richard Madden, with the majority of its faults coming from its conventional screenplay which doesn’t pack many surprises and fails to develop some of its more interesting aspects in favour of the traditional shoot-‘em-up climax.